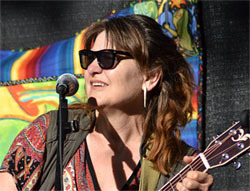 When Leslie takes the stage, expect to hear poetical street-wise lyrics that explore themes of human courage, spiritual enlightenment, timeless love, and just plain doing whatever it takes. reggae, and homegrown sass. Her clear, expressive, soulful voice has been described as spellbinding. A multi-instrumentalist, Leslie plays guitar and occasionally salts her show with fiddle and mandolin tunes. Her easy stage manner quickly engages audiences and fans describe her live shows as “captivating, fun and uplifting” – they often leave humming one of her tunes. Leslie began her music career as a Rock 'n' Roll singer in 1972. Her passion for creativity has evolved through three original music CDs, as well as careers in radio, television, film making, advertising, and media production of all types. One of her favorite projects was producing and hosting the original "unplugged" cable series “Northwest Tunesmith” that featured Northwest musicians. Leslie is active in Folk Alliance International as Publicist for FAR-West Regional Conference. 2017 Tumbleweed Songwriting Contest Finalist "A Place Called Harmony"
2014 Song of the Year Contest Runner Up for "﻿It's a Mystery﻿"